"Talking of tall stories," he said presently, "would you like to hear a perfectly true one for a change? It has a bearing on that antagonism—which we've just seen instanced—that exists between the artistic and the business mind." "I Killed Him All Right." The best people on their worst behaviour may be seen at the Giardino Rosa Club in Soho. Artists, musicians, and people prominent in business and professional life dine there. Manners are free and easy, even by present-day standards, with the result that odd and often disconcerting scenes are to be witnessed. Sir Roger Mottram, the surgeon, leaned his elbow on the dining table and twisted round to witness an altercation at the bar between money and art. The decision was awarded to money, the stocky, splenetic, and well-tailored business man receiving the apologies of the club secretary, and the shabby, fiery-eyed gentleman of genius being thrown out. "A gorgeous place, this, Hawke," said Sir Roger to his companion. "It's all so commendably silly." "The chef's hat," he said, "the prices, and the stories you hear are the tallest in London." The detective drew on his cigar for a moment. "Yes, I think so," said the surgeon, consulting his watch. "I had arranged to see a titled lady with nothing the matter with her. My assistant will be equal to the job though." I don't know whether you've ever been to Polford-on-Sea, said Hawke. You've missed something if you haven't. There are rugged headlands, sweeping bays, and silent, glassy inlets. The downs are a cool green, and the cliff faces show a rich colouring. A sculptor fellow named Charles Whitley lived in a bungalow at the back of the town. Just such a chap as that one who was thrown out, you know. The very antithesis of the man who was allowed to remain. Whitley hated everybody in Polford because they thought only in terms of rent. To his eye they all seemed to be little-minded people preoccupied with the problem of earning a living or building up a fortune; hedged about with fears and prejudices of their own making; respecters of persons, mouthers of catch-phrases and second-hand ideas, believers one and all in the virtue and power of wealth. Yes, exactly, my dear Mottram. Like the pompous one at the bar, to whom the club secretary grovelled. Whitley saw them all like that. All, that is, except two. There was a girl named Christine Collard, daughter of a Polford boardinghouse-keeper, a foolish little hussy, who, nevertheless, persuaded him that she was of his way of thinking. Whitley and Christine became engaged, though the prospect of marriage seemed rather remote. Whitley, you see, was not only penniless, apart from the small annuity on which he managed to exist, but regarded it beneath him as an artist to try to earn a living. He had ideas of personal freedom which suited the irresponsible and flirtatious Miss Collard, who met many interesting visitors at the boardinghouse. The only other person for whom Whitley had any use was actually not so much a person as a myth. He was a gentleman constantly referred to by Whitley as Beaky Binks. Whitley had not met him for some years—not since student days, in fact. They had been close pals, held together by the artistic bond. Both shone in the art classes. They had criticised each other's work, and brawled in defence of each other's ideals. In general it appeared, from what Whitley was constantly telling Christine, that he and Beaky Binks had stood back to back to defy all the meaningless trappings of priggery that beset one in the vulgar workaday world. Since those days Whitley had never met anyone like Binks. Everyone he had encountered since art school days had outraged his sensitive soul. "They're only half-alive," he'd say to Christine. "They smile politely, and they talk and talk, without ever meaning a damn thing. They're afraid to breathe the air for fear it might be the property of the squire, or some limited liability company. They treat the sky and the sea and the landscape as though it were a man-made park, with keep off the grass ' warnings. And they like parks, by the way, better than natural scenery. They can't see any scenery until it's got a spiked fence round it and a bandstand in the middle of it." That's the way he talked to Christine. She approved, and he deceived himself that she understood. Then he'd tell her about Beaky Binks. "If only we could meet up with old Beaky," he'd say. "A real vital sort of fellow, Christine. Someone you can talk to about things." It was apparent, even to Christine, that Whitley had idealised his old friend, and might be disappointed if they ever did meet again. He refused to accept the argument that adulthood could in any way have altered Beaky, except—if such were possible—in the way of effecting an improvement. "He wouldn't have deteriorated," Whitley declared. "Not Beaky. The world wouldn't have got him down— wouldn't have turned him into a dried vegetable. He'd have resisted its oppressive influence—would have fought back at it tooth and nail. He was a born fighter for honesty and freedom, was Beaky." Christine had a gift of listening, and she allowed him to prattle on. When she got bored with his company there was usually some diversion to be got from the holidaymaking men-boarders at her mother's private hotel. They hadn't Whitley's hypnotic presence nor his dazzling conversation, but they usually had money, and Christine was not averse to expensive amusement. One of the summer boarders was a Mr. Smith, a gentleman of considerably more wealth than any of the other boarders. Christine was the attraction. Otherwise he would have stayed in a first-class hotel. He took Christine about in his flash car, and they attended dances and music hall shows together. Smith was exactly like that man over at the bar there (Hawke continued). Cocksure and abysmally ignorant. His conversations were dreadfully dull, being a mixture of witless jokes in bad taste, maudlin sentiment, and hypocritical aspirations. Even Christine seems to have been revolted by his behaviour, for she told Whitley about his tipsy attempts at love-making. He had great mauling hands, and she shivered at his touch. Whitley was merely bored by her account of Smith. He dismissed him with a wave of his hand. He had not met Smith, and had no wish to. Such a vulgarian was so utterly beneath his consideration. Now we come to the drama. One Friday night about half-past nine, Smith was found dead in a shallow, rocky pool at the foot of the East-over Cliff, having apparently fallen over the precipice. When the body was examined at the mortuary, however, convincing evidence was found that death had been due to strangulation. Scotland Yard was called in, and, as I happened to be going that way on business, my friend, Detective-Inspector Gray, prevailed upon me to drive him down there. I took Tommy with me—Tommy Burke, you know, my assistant—and we stayed at the Collards' boardinghouse. Inspector Gray made inquiries about Smith's associates, and he discovered a possible motive for the crime which caused him to fasten his suspicions on Whitley, the sculptor. Gray went to work on the jealousy motive, and he found Whitley quite a likely-looking murderer. He was a tall, powerful young man, quite capable of having strangled Smith. His reaction to Gray's questions was startling. He promptly confessed to the murder, and gave elaborate details of how he had performed it. "I picked him up by the scruff of the neck and the seat of the pants," he said, "and I threw him over, with one labour-saving movement." Gray thought these remarks a little odd, and went on to ask him why he did it. "He wore squeaky brown boots," said Whitley. "He consumed whelks in public, and committed the foul and dastardly crime of informing me that it was "—Whitley gulped with emotion —"that it was a—a nice day!" At this point it began to dawn on Gray that the confession was a hoax, and he then found himself in the odd position of trying to establish the suspect's innocence while the suspect himself was vociferously and cunningly seeking to prove himself guilty. One fact emerged which caused Gray to give a policeman-like grunt of disgust and turn his back on Whitley. That fact was an alibi to which there were a dozen independent witnesses. You see, Smith's wristwatch had been smashed in the fall, and it had stopped at half-past eight. That the watch had been correct was vouched for by a local jeweller, who had supplied it to him that very afternoon. Well, between ten past eight and ten past nine Whitley had been in the saloon bar of a local pub, discoursing on politics with a crowd of men who knew him well, and amongst whom he was immensely popular. He couldn't have been in that bar and up on the top of the Eastover Cliff at one and the same time, so it seemed necessary to begin looking elsewhere for suspects. Poor Gray! Whenever he asks me to co-operate with him, I always get away with a lot of kudos to which I'm not really entitled. That's the whole point, Mottram. I wait until I'm asked, and he doesn't ask me until he's done all the spadework himself. As usual, I started where he left off, and made a thorough examination of Smith's belongings. 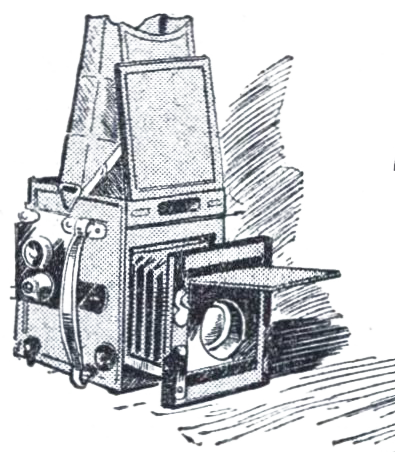 They included a small and obviously expensive reflex camera on which three exposures had been made. At the boarding house they happened to know the name of a chemist to whom Smith had gone for his supplies, and I took the camera along to this man, who was able to identify both the camera and the film, which he himself had inserted. He had torn the paper backing slightly, and that provided the identification. He had fitted the film on the Friday afternoon, only a few hours before Smith's death. He developed the film and made some prints. At first these seemed to offer no clue whatever. The only thing they proved was that the late Mr. Smith was an exceptionally fine landscape photographer. The choice of subjects, the composition, and the angle of view were perfect. The last of the three pictures, in fact, would have won a prize at an exhibition. It was taken from the Eastover Cliff, and showed the headland across the bay, with the sun, a big red disc, sufficiently dull for the film to take clearly, just touching the horizon. You see the significance of that, of course? The sun established the time when the photograph was taken, and that time was not half-past eight, but half-past nine. Smith had taken a photograph one hour after he was supposed to have been killed! The immediate inference was that the murderer, in order to establish an alibi, had set his victim's watch back an hour—after killing him—smashed the glass to stop it, and then pitched the body over the cliff. That part of the cliff-top is well concealed from view', and the inlet below was sealed by the ebbing tide, so that there were no people on the beach. It was late in the evening when I had reached this stage in the inquiry (said Hawke), and I got Tommy to drive me to the Eastover Cliff. Leaving him in the car at the end of the beach road below, I walked up the cliff path, which is not designed for vehicles, and, arriving at the spot from where the body would have been pitched, I made a minute examination of the ground. It was gravelly and grassy in patches, and things did not look too hopeful at first, but I was helped by the glint of the setting sun on some tiny fragments of glass. With the aid of a pocket-lens I had assured myself that these were pieces of watch-glass, when I noticed a large, smooth pebble close by. One side of the pebble was damp, with a film of soft clay adhering to it, and it clearly showed fingerprints. The lens showed sufficient crystals of powdered glass sticking to one edge of the stone as to establish it as the stone with which the watch-glass had been smashed. Those finger-prints therefore constituted a valuable clue. I stood up to get an envelope from my pocket, in which to put the powdered glass and the pebble, and found myself standing face to face with Whitley. I met his eye, and got the impression that he was looking right through me. "Mr. Hawke," he said, "I think I begin to see how hopeless is the criminal's position in face of the recondite yet ruthlessly-methodical workings of your mind. "Tell me," he went on, in ordinary conversational tones, "what gave you the idea of searching for evidence of a smashed wrist-watch?" I showed him the photograph of the setting sun, and explained how it had served to indicate that Smith had been alive at a later hour than his watch suggested. "Beautiful," he said, and I don't quite know whether he was alluding to my reasoning or the picture. "It certainly is a good picture," I said. "Photography," he said disdainfully. "I suppose up to a point the camera can express soul as well as a mallet and chisel, or a paintbrush. But the method is mechanical, and unworthy of the true artist." I then informed him that he was not obliged to make any statement to me about the crime, and advised him to say nothing, but he only laughed, and in the most matter-of-fact tones confessed his guilt. "Oh, I killed him all right. It wasn't jealousy exactly, but I didn't see why a horrible, crawling mess like that should come along and rob me of my only real companion." He then went off at a tangent again, his remarks becoming incoherent at times. I grew uneasy about him. When he walked down the slope towards the cliff edge, I suddenly realised his purpose in visiting the spot. "Here," I shouted, "come back." From the purely logical point of view there was no reason why I shouldn't have stood aside and allowed him to throw himself over, but human instinct was against allowing another to commit self-destruction, and I rushed after him and grabbed his arm. It's difficult (Hawke went on) to convey the intense, heart-gripping horror I felt at finding myself on the edge of eternity. You've never stood on the edge of a precipice, Mottram? Not right on the edge. One doesn't. Within a few inches of it, perhaps, and certainly with the whole of one's feet on the ground. But I suddenly found myself with only my heels dug in and the soles of my feet projecting over into space. Whitley was actually leaning over, remaining poised there only by reason of my hold on his arm. I looked down between my feet, and saw a thin white thread of foam in the inlet below. A sailing boat imprinted itself on my vision. It appeared the size of a pea-pod. There was a drop, I suppose, of nearly three hundred feet sheer. I daren't move to take a pace back. I just remained there, rigid, horrified and impotent. Whitley shouted at me and tugged on my right hand, and, as I fell, I twisted over instinctively, the way a cat does, and flung out my left arm. I clutched something very little more substantial than straw—a small root of some kind—and hung on. Whitley's entire weight was now swinging on my hand, and my legs were kicking free in the air. I was quite ready to let him go, but it was he who was hanging on. He had conceived the notion to take me with him. "Come on, Hawke!" he bellowed. "Violent death is the only destiny for real men." I heard a loud roaring a short distance away, and it was more with a feeling of despair than of hope that I saw my car with Tommy at the wheel suddenly appear on the cliff-top. He had seen the struggle by standing on a wall on the beach road, Whitley's approach having aroused his curiosity, and he had brought the car up that rocky and all but impossible slope. He had roared up in bottom gear, and though he was obviously scared stiff at the situation in which he found me, he acted with magnificent presence of mind. It was quite impossible for a small chap like him to drag us back. He had no purchase for his feet, and the strain of our combined weight would simply have yanked him over as well. He tied a couple of car rugs together to make a rope of them, and affixed one end to the back axle. Then he backed close up to me and tied the other end of the improvised rope in a sort of a slip-knot about my elbow. He got back in the car again and opened up the throttle, leaning round from the driving-seat to watch the effect of his manoeuvre. I presently ventured to leave go of the root and grab the rug, trusting my entire weight to it. I slipped as I did so, and dropped about a foot over the edge. The jerk as the rug took my weight almost wrenched my arms adrift, at the same time freeing me of Whitley. His hold slipped, and, yelling like the maniac he undoubtedly was by that time, he went hurtling to his death. The car engine was roaring furiously, but there was no motion. I saw that the back wheels were skidding round on the grass, and the thing began slipping backwards. Tommy jammed on the brakes and threw out the clutch. Then he tried again, but with no better result. The back wheels were right on the edge of the cliff, and I was blackened and half senseless from the exhaust fumes before I managed to summon enough strength to haul myself up. I made Tommy get out of the car and leave it until it could be towed away. Good job I did, too, for he'd no sooner alighted than the earth under the back wheels gave way and the tiling went slithering over. It was smashed to pieces on the beach alongside the mangled body of Whitley. Anyhow, we did get back to safety all right. Mighty close thing, though, wasn't it? Hawke's silence left Sir Roger Mottram vaguely unsatisfied with the story. "I thought," he said, "that Beaky Binks was coming back into Whitley's life. I suppose that's one of the troubles with a true story—the obvious situation never develops." "Beaky Binks!" exclaimed Hawke. "You don't suppose anybody would really have a name like that, do you? It's the name of a comic paper character popular many years ago. Boys habitually confer such titles on one another as nicknames. "Beaky Binks," added the detective, "was Mr. Smith." "I'm obtuse," he said. "I ought to have realised it, for it provides the point to the story." "But what sticks in my mind," Hawke concluded, "is what happened to Whitley. The platform on which he had built his ideals failed him. Beaky Binks had been the inspiration of his life, and Beaky Binks had let him down. Therein lies the real motive of the murder. "Another aspect of the matter which should give you some food for thought, my dear Mottram, is that sunset photograph. "That last bit of art was the one remnant of the old Beaky that had been the inspiration of Whitley's life. "And it was that same last bit of Beaky's art which exposed Whitley's crime and settled his doom."